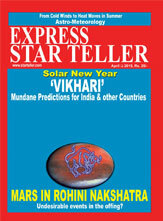 We would like to "Thank You" for deciding to subscribe for the monthly issues of "Express Starteller"
As a subscriber, you will be able to avail the free coupons that come with the magazine. Personal Problems: Any problem, be it your job or your health... get our expert astrologer to give you solutions and remedies. 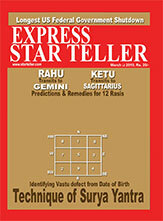 Marital Problems: Delay in marriage or disturbance, let our astrologers guide you. Spiritual Doubt: His Holiness Shankaracharya of Kancheepurm will heal you. Interpret your Dreams: Getting an enigmatic or repetitious dream?! Let our Dream Expert analyze them for you. Analyze your signature: Your character revealed through your handwriting! Even if the rates are revised, you will not be affected till your subscription period is over. For Subscription In India Please (print the subscription form) and send it duly filled alongwith your payment to our Chennai Office. If you would like to send a Cheque, Money Order, Pay order or Demand Draft, (as per the fee mentioned above) please send it in favour of Express Starteller to one of the addresses.